The Big Island has become 'ground zero' for volcano air tours in Hawaii because of the spectacular eruptions in recent years. These eruptions have been so spectacular in fact that it could be stated without equivocation that no person alive on the planet today has ever witnessed the extraordinary level of intensity that has been seen in recent times in these areas. The best way to see the volcanic activity is on the volcano air tours ! 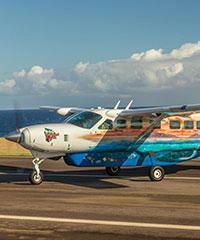 We offer discount pricing on many of these Big Island Air Tours. Viewing volcanic activity from the ground, in many ways is not efficient. Because the lava flows have been so violent and destructive many areas of the Volcanoes National Park have been closed and it is likely that many areas will not be completely reopened to the public in the foreseeable future. Because crater vents and areas of the lava flows are in most cases located inland from the roadways there is no effective way to view them from the ground. From the perspective of the air you can see the full scope of the lava rift zone and and view the entirety of the event in 'one fell swoop'. Is there any advantage, or disadvantage, for using a fixed wing aircraft rather than a helicopter? Helicopters can hover and airplanes cannot. This is a valuable capability when you are viewing a canyon waterfall or some spot that is located in a tight perimeter. Viewing the volcanic zones does not require any such specific capability however because the entire view-able landscape is located thousands of feet below. The view of the lava flow areas for all intents and purposes will be identical. Big Island air tours airplane sightseeing flights are less expensive than helicopters. As a general rule of thumb these volcano air tours will cost about 30% less. Big Island Air Tours do not pick up at the Cruise Ship Dock either in Hilo or in Kona. It is often simplest to arrange for a taxi to pick you up at the cruise dock. Another option is to have Tom Barefoot's Tours arrange to have you picked up by a Rental Car at the dock and you can drive to the departure location for your Big Island fixed wing air tour. Plane instead of helicopter to see the Big Island? 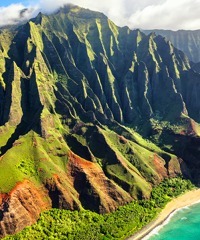 The Big Island of Hawaii is an amazing place to do an air tour. When we're speaking of air tours here in this category, what we're talking about is fixed wing aircraft, like this, not helicopters. Obviously they're both aerial tours, but we have a separate category for helicopters that you can see under our section of helicopters in the Big Island. This is strictly going to be referring to the fixed wing aircraft. I think a lot of people just don't realize that we have an availability for fixed wing aircraft that take you over and sight see the big island. They think of it exclusively as helicopters. We do have the helicopters. The helicopters are great, but in many ways you might want to consider actually using a fixed wing aircraft for visiting and flying over, sight seeing the Big Island. One, the big thing about helicopters that really make them really worthy as a sight seeing aircraft is the fact that they can hover. They can actually get over an area, into a valley, kind of get into maybe a tight spot and then really see what's going on. Up to a waterfall, that kind of thing. They're just remarkable machines for those purposes. In areas like many places that we have on the Big Island, particularly the volcanic area which is kind of the spots that everybody wants to see. You're looking from a distance, whether you're in a helicopter or you're in a fixed wing aircraft, down at the surface of the earth. You're not in any tight spaces, so the hovering aspect of the helicopter in those areas is not as important as in some other areas. The same viewpoint, identical in fact, can be seen from a sightseeing aircraft, where you're just going at really slow speed over the rift zone and the volcanic activity and the lava coming down and looking in the Pu'u O'os, the vents and seeing all that. You can see it just as well from that vantage point from the fixed wing aircraft. They actually crisscross that area many times so you can see it all really, really well and everybody gets a chance to see everything on this, whatever is happening that particular day. The other advantage that you have with a fixed wing aircraft is cost. It's considerably less costly to fly and do a sight seeing flight of the Big Island in a fixed wing aircraft than it is in a helicopter. These are simply less expensive to fly. You might want to consider using one of these aircraft. Generally these are going to be going from Kona, the Kona side, though not exclusively, and they change over time, but the main tour that we have ... Let me pull up a ... The main tour that we have is going to be leaving from Kona and doing a complete circle island or almost a complete circle island and seeing so much of the island. This is going to be probably close to a two hour flight. When you compare the prices of this two hour flight to a two hour flight in a helicopter, you'll see that there is a big difference. They'll be going from the Kona area and heading across, usually across the saddle, it's referred to, between these two giant, Mauna Kea and Mauna Loa, the two giant mountains that we have. They go up about 13,000 feet plus. You go between the two on your way over to the active volcanic area which is in Kilauea here. Here you're going to be able to just crisscross this area, see all the activity that's happening on the particular day you're showing up. It does vary from year to year and month to month as to what's happening. You may be able to look right down into the vents and see lava coming up, coming down in lava tubes down toward the ocean. Maybe it's actually going into the ocean, then you're having these huge plumes of gasses and steam that are rising up. You're always able to see something at some point. Then they're going to continue on over to Hilo and then along the Aumakua coastline, which is one of the most beautiful ones we have in Hawaii, and up into the Kahala forest and so on in these areas, back down around towards Waikoloa and then all the beautiful beaches that we have and the resorts and so on that you'll be able to overlook. Then land back in Kona. That is an opportunity. This is an opportunity for you to maybe save a little money, really see a larger chunk of the Big Island, get a little bit more of a bang for your buck. It works really well on the Big Island simply because of the geology of it here where you've got those areas that are more spread out. Give it a consideration. Air tours on the Big Island.